Thus far in the calendar year 2019 (CY19), the stock has outperformed the market by rallying 21 per cent, against a 6.7 per cent rise in the S&P BSE Sensex. 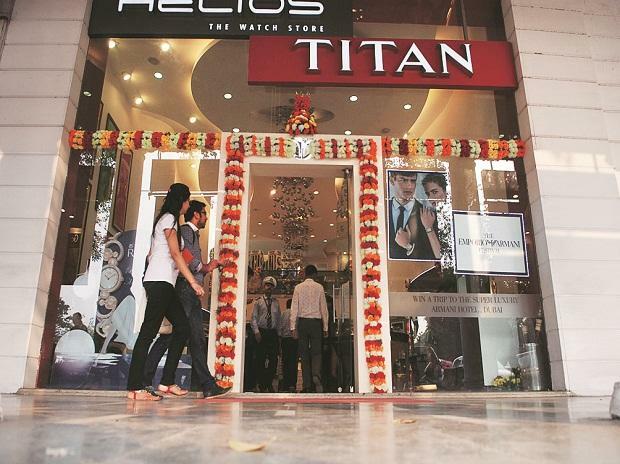 Shares of Titan Company has joined the elite club of Rs 1-trillion market capitalisation (market-cap) after hitting a new high of Rs 1,129, up 1 per cent on the BSE in the intra-day trade on Thursday. The stock surpassed its previous high of Rs 1,123 touched on March 12, 2019. The market-cap of Tata Group Company hit Rs 100,231 crore in intra-day trade today. Currently, there are 29 listed companies having market-cap of more than Rs 1 trillion, BSE data shows. The company reported strong growth of 41.6 per cent in net profit at Rs 416 crore in the December quarter (Q3FY19) on the back of healthy performance in jewellery segment. The company’s jewellery business reported a robust 37 per cent sales growth led mainly by grammage growth of 20 per cent. The company sales are expected to grow faster on the higher number of wedding dates in Q4FY19 and Q1FY20. According to analysts, Titan will continue to benefit from the shift of demand in jewellery retail from unorganized to organized segment post demonetisation and implementation of Goods and Services Tax (GST). The company has witnessed strong year-on-year revenue growth for nine straight quarters ending December 2018 leading to market share gains. Last month, the rating agency ICRA reaffirmed the long term/short term rating of fund-based/non-fund-based facilities of Titan with outlook revised to positive. ICRA believes that Titan’s revenues will continue to witness margin expansion and steady growth, supported by a strong brand presence and steady demand. Titan’s strong parentage and robust financials in the form of high and consistent profitability, zero net debt and strong liquidity are other factors that support the rating, the company said in a rating rationale. The brokerage firm Prabhudas Lilladher has a ‘buy’ rating on the stock with the target price of Rs 1,195 per share. We maintain a positive stance on Titan post Q3 results given the guidance of 22 per cent jewellery sales growth and opening up of 40 Tanishq stores in FY19, expected gains from backward integration and proactive strategy in Eyewear and success of new collections in watches, the brokerage firm said in a result update.